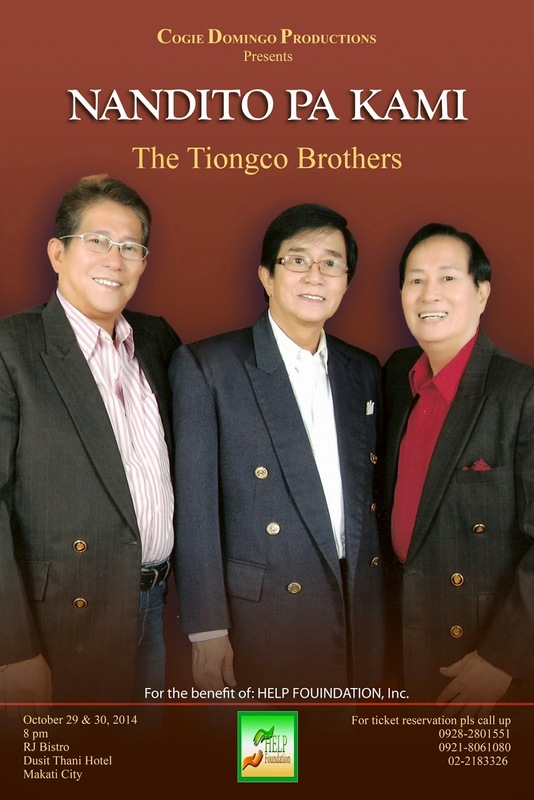 The country’s national treasure for entertainment and Aliw Awards Lifetime Achievement Awardee, The Tiongco Brothers will perform at Bistro RJ in Dusit Thani Hotel this October 29 and 30. The Audience can look forward to the Tiongco Brothers' execelent blending of their voices the brother trio has been known for more than five decades in the Philippine entertainment history. The musical talent and versatility of the legendary Filipino top trio--Jun, Emil and Arthur Tiongco is famous for its exceptional and memorable performances. They were the first Filipinos who performed in the world-class Sydney Opera House, and in Saudi Arabia as guest of the ARAMCO (American Oil Company). It was The Tiongco Brothers of Sta. Rosa City, Laguna that brought the Filipino brand of music in various parts of the world in the late ’50s and in the ’60s. Their voices they captivated the appreciative hearts of their audiences in New Zealand and in the United States. There were only few original Pilipino music performers that made it to the hit chart during their era. Their rendition of the Platters Medley, Four Aces hit songs, Lettermen songs brought back the golden years of live entertainment in the Philippines. They sing songs popularized mostly by foreign singers during their time. The Trio's vocal prowess were so exceptional that they were being introduced as the Four Aces of the Philippines in their travels abroad. Indeed, there has never been a group of Filipino singers so adored as the fabulous Tiongco Brothers since then and until now. Watch the show NANDITO PA KAMI on October 29 and 30 to witness one of the few rare performances of the Tiongco Brothers. They still sing, dance and deliver jokes with the perfect blending which made them famous. Part of the proceeds of Nandito Pa Kami will go to HELP Foundation Inc.